2004: 84-88-91 = 263 points (16th). 2002: 5-90-93 = 188 points (29th). 2001: 30-84-91 = 205 points (24th). 2004: 90-94-97 = 281points (2nd). 2003: 03-86-96 = 265 (7th). 2002: 94-81-96 = 271 points (7th). 2001: 90-90-100 = 280points (1st). 21/04/2002: 94-90-100 = 284 points. 31/10/2001: 97-88-94 = 279 points (2nd). 26/08/2001: 90-90-100 = 280 points (1st). 06/04/2002: 98-92-98 = 288 points (1st). 07/04/2001: 96-94-95 = 285 points (2nd). CAC Kaunitz: Jugend-Klasse SG 1. CAC Recklinghausen: Gebrauchshund-Klasse V 1 CAC-Res. Working Dog Class CAC: Finnish Champion V 1, Best of Breed male. Körklasse 2 A (2 years of age). Asco von der Burgstätte competed three times in the D.V. Meisterschaft and was also the Landesmeister of Landesgruppe Westfalen in 2001 with 288 points (98-92-98). Asco passed the Körung 'for life' with highest rating for hardness, courage and working drives with middle sharpness plus winner of an internationl conformation show in Finland. His dam, Brista von der Doberwache (litter-sister to Bronco) and his sire, Alfred von der Urftquelle, both passed the Körung with highest rating for hardness, courage and working drives with middle sharpness. Also, Alfred was the winner of the working IDC World Championship in 1999 with 286 points. Asco tested clear for PHTVL / PHPV and lived to over 9 years of age. His sire lived to 5 years of age (Alfred passed away from severe pneumonia) and his dam to 11½ years of age. Kuba: SchH 2 and passed the ZTP with 1A rating for character. She is the dam of Torres “A” litter (Argo). Lucky: SchH 1, V conformation rating and passed the Körung 'for life' with Körklasse 2B rating. Arcon: SchH 1 and passed the ZTP with 1A rating for character and SG for conformation. He is sire of the von der Burgstätte “J” litter and vom Ferrenberg “K” litter. Ringo: IPO 3, FH 2, DV-DM Vice-Leistungssieger, Landesmeister FH 2. Rocco: IPO 3 and passed the ZTP with 1A rating for character and SG for conformation. Conan: IPO 3, DV-DM participant and passed the Körung 'for life' with highest rating for hardness and working drives with middle sharpness. 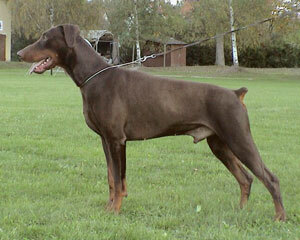 He is sire of the vom Aurachgrund “P” litter.